Revelation. Chapter 22. The last chapter of the last book in the Bible. A lot of us tend to shy away from the book of Revelation. It is full of end-times actives, angels, heaven, books with seals, and rich in symbolism that even Biblical scholar’s don’t always agree on. It can be a tough study. 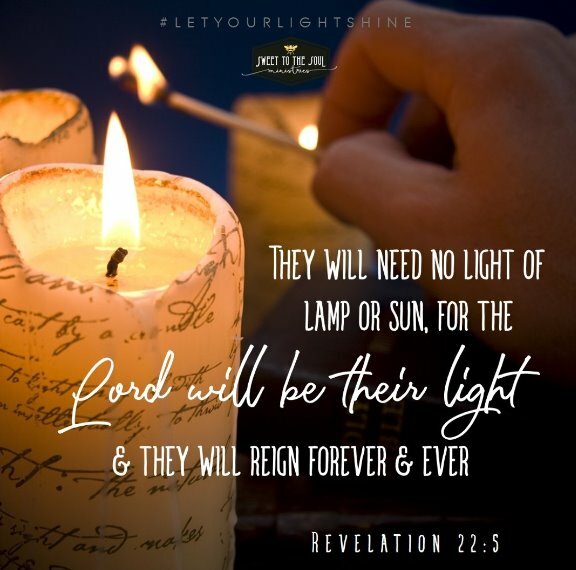 But for us, I think today’s scripture is the perfect verse to wrap up our 31 days of learning how to let our light shine. In Revelation 22:5, John is actually revealing to us three truths about what the angel of the Lord has shared with him about Heaven and the scene surrounding the crystal river of life flowing from the throne of God. So let’s unpack our scripture and take a look at each truth separately. In this verse, all three of these scenarios actually apply. And why will there be no darkness in Heaven? 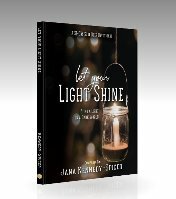 During our study we’ve learned of many ways God is a figurative light in our lives right now as we live here on Earth. But in Heaven, He will become a literal light, driving out all darkness. 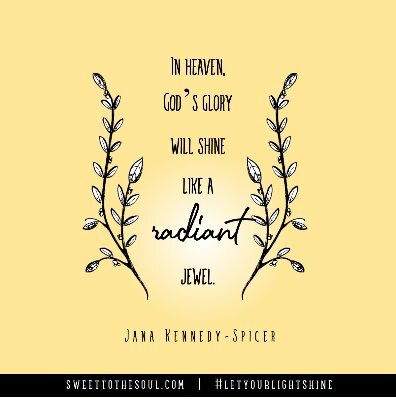 So you can just imagine God’s radiant glory fully exposed to those in Heaven and in their transformation becoming literal lights reflecting the glory of God. There is no wonder there will be no need for a sun or moon! But we are also told that there will be ones who reign, or rule, side by side with God in Heaven. An eternity in Heaven with God, in His service, no more darkness, pain, anguish, and the incomprehensible splendor of God’s glory illuminating the heavens. Oh my. Compared with our earthly woes, some days I just can’t wait. Sometimes we make the mistake of reading a verse in the Bible and automatically applying it to ourselves. While there may be a lesson for us to learn, every scripture and promise does not necessarily apply to every person. So it is important for us to learn who is the “they” John is speaking of. Does it include you and me? You see, this spectacular heavenly sight is not for everyone. There are two groups of people, the “they” that will witness God’s glory eternally and the “they” that will not. Interestingly, when the angel of God was making the heavenly revelations to John, even he asked the angel, “who are these?” (Revelation 7:13). 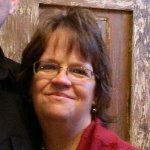 “They” are the saved by Christ. “They” are the ones who have accepted the free gift of God’s grace which has been offered to us from Jesus Christ through the shedding of His blood to blot out our sins. It is very important to note, no, it is the most important thing to note, that only those cleansed by Christ’s blood will experience the truth John reveals to us in Revelation 22:5. Will this be you? Can you reread today’s scripture, substituting your name for “they” and it be true? If not, or if you’re not sure, I invite you to go back and reread day one of our devotional, and talk to God about accepting His free gift of salvation. Dear Lord, we thank you for the beautiful glimpse into heaven, that there will be a day when those redeemed by Christ’s blood can live eternally in the light of your glory and grace. I pray for each woman reading this today Lord, that in their heart they have received your gift of forgiveness. I ask forgiveness for the all the times I have failed to be a reflector of your light, and I ask you to make me more aware of the opportunities to share the message of your love and grace with others. Until that day that I can spend eternity in your presence, I ask these things In Jesus’ name, Amen.